I’ve been lucky to share a lot of special memories with my Grandpa while growing up, but I recently realized we have never enjoyed quality conversation over a glass of good wine. This past Christmas my wife and I gifted my Grandpa a spin-off of the program “Meals on Wheels”, where we’d schedule one monthly home-cooked meal for him at our home, or his. What better way to resolve this void in our relationship. At our January meal, I served a bottle of Willamette Valley Vineyards (WVV) Riesling with our dinner, capping off the meal with the WVV Frizzante to go with a chocolate mousse (yes – just like the Oregon Wine Blog’s Christmas Dinner). 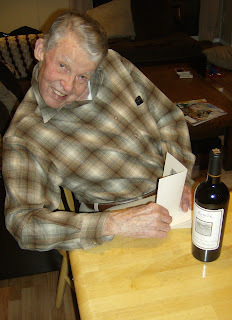 I always knew my Grandpa liked wine, although I was more familiar with his typical Restaurant choice – Zinfandel. I figured the Riesling would be a good conversation segway to my newfound wine appeal. My Grandpa took interest in my new hobby, explaining long-time family friends of he and my Grandma’s, (The Keevers) are Vintners at a Winery in Napa Valley – Keever Vineyards. My Grandpa didn’t know much about the winery, but I made mental note – thinking of “what could be” for February’s meal. At the conclusion of the meal, and after saying goodbyes, my first priority was to locate Keever Vineyards online, which I did. Navigation through the website revealed an address for the winery, and showed a 100% Estate Grown, Cabernet Sauvignon, priced at $68.00. I penned a letter to Bill Keever (Owner/Operator), explaining the circumstances regarding our “Meals on Wheels”, and told him I’d be purchasing their wine in the near future, while asking for two special requests. I requested my bottles be signed, and that he write a brief note to my Grandpa, which I’d present at February’s meal. A week after sending the letter, Bill Keever wrote back, with anticipation for what our February meal had in store. A short week later, two bottles of wine arrived, signatures and all, in addition to a personal note addressed to my Grandpa. Our February meal occurred last Friday, and figuring my Grandpa’s positive reaction, we invited my parents and brother’s family to enjoy in the occasion. I went to present my Grandpa with his bottle of wine, card and all, and was overwhelmed with his response. His gratitude and appreciation was something I’ll never forget. We opted to pop the cork on the bottle, utilizing a decanter to aerate the wine. Now, to accurately assess the Keever Cabernet Sauvignon, and to hold some level of objectivity, I asked my dad and brother to bring a bottle of Cabernet Sauvignon, representing the Northwest Viticulture. What arrived were a Silver Lake 2005 Cabernet Sauvignon (Rattlesnake Hills AVA) and an Idaho wine, Sawtooth - 2004 Cabernet Sauvignon. 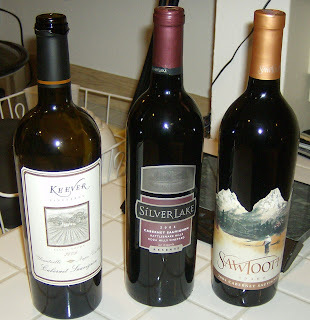 My wife and sister-in-law assisted in serving up a traditional blind taste test, which resulted in a hands down favorite being the Keever Cabernet; superior in taste, but also its aroma, development and finish, neither my dad, brother, nor I, noted any flaws. Sitting in the glass, the wine evinced its elegance, showing off a satiny smooth structure, distinguishing itself as the Varsity member of the trio at hand. An array of fruits presented themselves in the nose, most prevalent to us being spiced plum and dark cherries. Winemaker Celia Welch Masyczek describes the wine as “Classically elegant at entry with very fruit-centered flavors up front”. I couldn’t agree more. I respected the 100% Estate Grown Cabernet grapes, and felt some indebtedness to a wine with such close ties to my lineage. While comparing Napa grown wine to Washington/Idaho wines may have been comparing apples to oranges, I can say that drinking the Keever Cabernet opened my eyes to the world of quality, exquisite wine, and as such, has raised the bar for wine reviews to come. Thank God I have that second bottle! That was a great way to show Grandps you love him and are thinking of him.